Many rifle owners love the M-LOK handguard. The ventilated system is low profile, takes up as little space and weight as possible, and allows you to be creative with your accessory and upgrades set up. 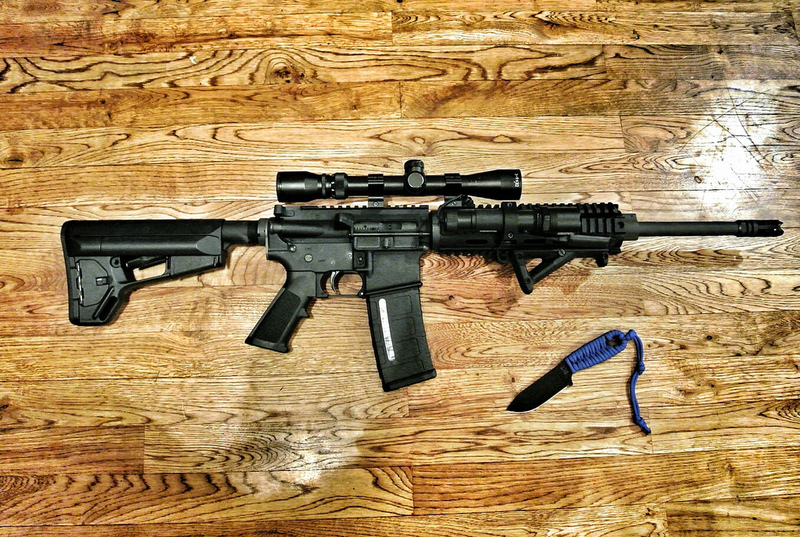 If you want to install a foregrip, but you aren’t sure where to begin, then read through our review of the best M-LOK foregrips for the money. We’ve selected our favorite foregrip for the end of the review. There are two main styles of foregrip you can choose from: vertical and angled. The vertical foregrips are great for shooters who want maximum control of recoil. The straight up and down design also allows you to support your weapon while you use a free hand to grab for an extra magazine, turn on a laser, or do whatever you need to do. Angled foregrips are best for those who like fast follow up shots and need a better distribution of weight across their arm. Whichever style you prefer, we’ve got it covered here! 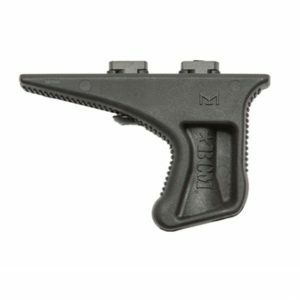 Materials – This first M-LOK foregrip from Bravo Company is made entirely of polymer, which has been reinforced to resist the recoil of your rifle and molded into an angled shape. It’s designed specifically to promote a repeatable hand position that is secure while firing and to develop muscle memory for some of the fastest target acquisition you can perform. It can install on literally any M-LOK compatible handguard. Portions of the grip have been hollowed out to ensure a light weight and minimal bulk on your weapon. Lining all gripping edges of the angled foregrip are horizontal grooves to avoid sweat buildup and slipping hands or fingers. It can be purchased in all black or flat dark earth. Performance – This is perhaps one of the most classic styles of foregrip you see on the market. It’s a very traditional angled style, and the Bravo Company isn’t kidding when they say it’s built to strengthen muscle memory. With little eye focus, it’s easy for your hand to naturally grasp where it needs to. It keeps your arms and hand at a comfortable position, and there is enough grip there for you to hold onto and feel confident while shooting. What we’re not sure about it the hollowed out portions within the grip. Bravo Company did this to remove unnecessary weight, which we appreciate, but it’s easy for fingers to sort of fumble in the middle area. Maybe we are just being picky, but we feel that could have been designed a little better. What we say – This is the best M LOK foregrip for shooters who love the classic angled grip. Especially if this is a style your body is already used to, this is a great choice for you. Materials – Although also an angled foregrip, this option from Magpul is designed entirely differently from the previous choice. 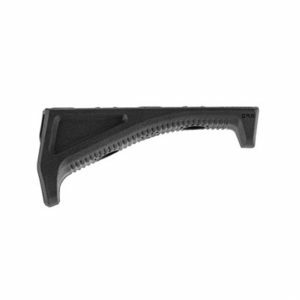 It is made of a lightweight but durable material that only adds approximately 1.2 ounces of weight to your M-LOK handguard and the overall construction of your rifle. The ergonomic shape is designed to allow the shooter to have a firm hold of their weapon while firing and have an even distribution of weight pushing against the wrist and arm. You’ll have better control of recoil and faster follow up shots. Similar to the first choice, this angled foregrip has the same horizontal grips to avoid sweat buildup. Performance – You’d have no idea that “angled foregrip” could come in two wildly different styles. Magpul has a different take here, and they are focused on keeping a low profile and keeping as much out of your hand’s way as possible. You can still rely on muscle memory here, but the weight of your weapon will be distributed a little differently across your forearm and in the palm. 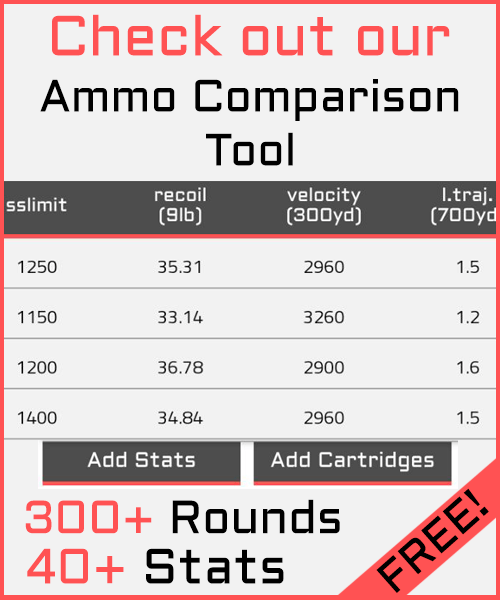 We may disagree about having better control of recoil. At least, we wouldn’t say that part is necessarily improved. You don’t have anything to really fully wrap your fingers around, so there’s some give and take. For some, this is the most ideal style of foregrip. What we say – This is the best M LOK foregrip for shooters who want their hands closer to their weapon, in a sense. You’ll have a better balance of weight through the arm and improved control. 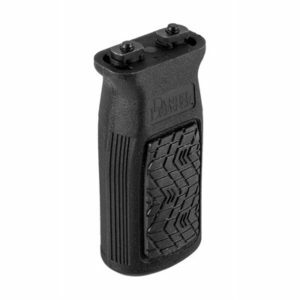 Materials – With comfort in mind, Daniel Defense provides a rubber over molding on their grip to avoid calloused hands. The over molding will last through all wet and dry weather conditions as well as resist sweat build up or damage from it. In fact, the vertical grip even has a storage compartment inside of it for storing small essential items. This compartment is also resistant to water and moisture. The foregrip is just over three inches long, two inches wide, and just over an inch thick. Without anything stored inside it, this vertical foregrip weighs less than a quarter of an ounce! It can attach to any rail with M-LOK compatibility. Performance – You may have noticed that most foregrips you’ll come across are made with polymer. Polymer is a very durable plastic for weapons and accessories, and you shouldn’t expect any damage to come to it while using it normally. However, especially with rifles, you can easily have some sweat buildup in your palms. That’s why we love the rubber over molding on this grip. The textured design allows for some air flow under the palms. Plus, it’s way more comfortable to hold for long period of time. With the straight vertical design, it serves as a means of carrying your weapon. The storage compartment can be used for extra batteries for your laser or scope, if you like! This grip, however, is very small. Make sure to stretch your hand so it doesn’t cramp up. What we say – This is the best M-LOK foregrip for shooters that want a straight-forward gripping style. It’s also best for those that don’t want to hold bare polymer for long periods of time. 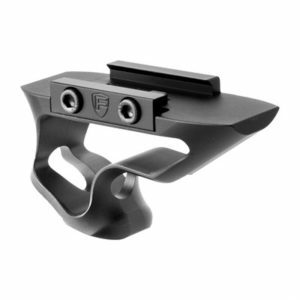 Materials – Back to angled foregrips, but certainly nothing like the others, Fortis Manufacturing offers an option that is considered a hybrid. It is constructed with aircraft grade 6061-T6 aluminum and machined as a one piece billet design. It has been anodized with a Mil-Spec type III hard coat. Although not this lightest in our review, it still only adds two and a half ounces to the overall weight of your weapon. It’s made entirely in the United States and can attach to any M-LOK handguard. The organic design allows for multiple style of holding and even serves as its own hand stop. Performance – If polymer is not for you, then this is one of the best foregrips your money can buy. The aircraft grade aluminum is far more durable, and it will be much better for resisting recoil from powerful weapons. Fortis has created a truly innovative design that allows the user to hold their grip in the way that is most comfortable to them. This also makes it less likely you’ll have to install a hand stop as well. We can’t say we’ve seen another rifle foregrip that looks quite like this. Of course, it is the most expensive option within this review. It’s also going to be significantly heavier than the polymer constructions, but it’s still only a few ounces of weight. While the other foregrips are intended to feel like nothing is there at all, some shooters may prefer that little extra bulk for gripping! What we say – This is the best M-LOK foregrip for those who want the most durable foregrip on the market and feel comfortable holding their weapon in multiple hand positions. This was a tricky one for us! The four foregrips we’ve selected for this review are all quite different from each other. They all come with some varying pros and cons. If you prefer a particular style, then go with what will be most comfortable for you. However, our favorite was the very first option we reviewed. The Bravo Company M-LOK BCMGunfighter KAG Angled Grip is a tried and true foregrip that should satisfy the majority of us. The classic angled design is trusted by many, and it serves its purpose well. The strangely hollowed center can be worked around, and it was just a small design flaw in our opinion. The polymer is perfectly lined with grooves for a comfortable hold that will make you feel confident while shooting. Your hand can rest comfortably, but you’ll still have a firm hold.